Information regarding how the murti (idol) of Brahma should be crafted is mentioned in the Rupamandana. Brahma has four peaceful looking faces. The four heads faces the four quarters. 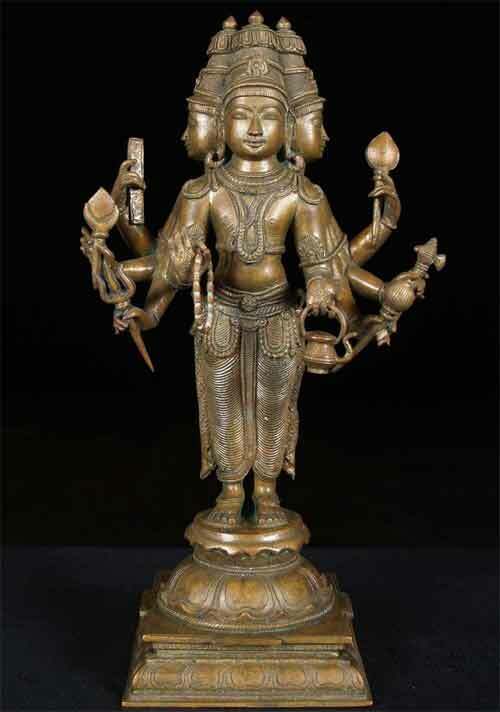 The murti of Brahma should have four arms and a beard. The main murti of Brahma can be standing, sitting in padmasana posture or sitting on a Swan (Hamsa). Swan is the vehicle or Vahana of Brahma. Sometimes Brahma is depicted as a chariot drawn by seven swans with consorts Saraswati and Savitri. Text like Silparatna states that murti of Brahma should be seated on a mat made of long grass. When the murti is in standing posture, it should be in padma pitha. The color of the murti should be chrome yellow and the color of the eyes is orange. The crown should be adorned with ornaments. There is also a white thread on his chest – the yajnopavita. Earrings are made of gold or ruby. The hair color can be red, white or crimson. The four hands should hold akshamala and handful of kusha grass on the right hand; the left hands hold ankusa and Kamandalu. Sometimes sruk and sruva are held in the right hands; ghee pot and kusha grass in the left hands. Sometimes the front hands are held in abhaya and varada posture and the back hands hold akshamala and Kamandalu. Sometimes the right hands hold akshamala, sruk, and the left hands hold book and Kamandalu. White sandal paste and white flowers are used to decorate the murti. The waist band should go around the loins and the lower portion of the body is covered with white clothes. The upper portion of the body is covered with a deer skin.